The digital ad spend for QSR and Fast Casual as measured by Placed increased by over 1,000% between 2014 and 2018. But where is that money being best spent? What advertising channels work better than others? The answers might surprise you. Pulling from QSR and Fast Casual campaigns and visitation trend data, we were able to provide a list of best practices going into 2019. • QSR marketer advertisements do better than average vs. other categories of marketers in terms of incremental visits and cost per visit. For example, over 50% of QSR campaigns drove incremental visits versus less than 48% for all categories, and their cost per incremental visit was 20% lower. This could be attributed to these campaigns generally being more promotional than brand-oriented messaging. • Audio and social advertising drove both high lift and low cost per incremental visit (CPIV). At the same time, over 40% of programmatic impressions drove incremental restaurant visits, though the CPIV wasn’t as effective as audio or social. This highlights a significant opportunity to optimize against cost, as programmatic in general is driving lift. • Of the 2,000+ QSR and Fast Casual campaigns evaluated, audio and programmatic campaigns showed lift more often than other channels. 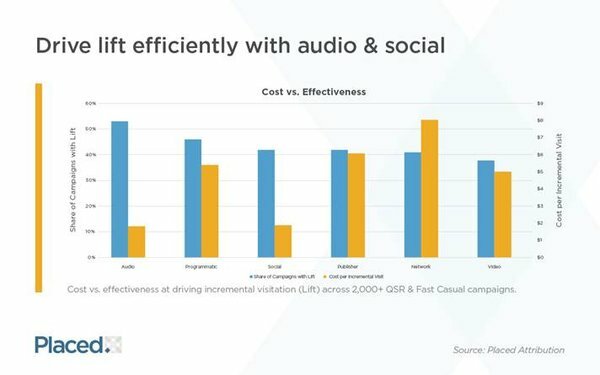 However, after adding cost as a factor, a different story becomes clear: programmatic advertising has room for improvement as compared to the efficient CPIV for QSRs on both audio and social. • Digital advertising is a great tool for reaching specific audience segments, but in order to make the most of it, it’s important to know who the ideal audience is. In this study, audiences were segmented in two ways: by age range and by visit frequency. The pattern shown in segmentation by age group is consistent with what we see across other categories—compared to the general population, younger audiences tend to be more responsive than older ones (Lift Index). However, targeting based on real-world behaviors (frequency of visits) shows the potential for consistently higher lift than any of the age segments. Combining these results suggests an opportunity to convert a young, non-loyal audience. High organic visitation makes QSR performance look good relative to other categories, but that’s not the whole story. Set relevant benchmarks based on campaign goals. Reach your core audience to message a new product using cost per visit (CPV), while drive net new visits to your stores with a focus on cost per incremental visit (CPIV). The most efficient digital channels for influencing the QSR & Fast Casual audience are audio and social. Programmatic and publisher-based networks also tend to perform well, but at a higher cost per visit. The massive scale of the QSR and Fast Casual audience makes linear TV a strong advertising channel, but a naive approach that is focused solely on reach leaves opportunity on the table. Foot traffic measurement makes it possible to reach your audience even more efficiently. Compared to the general population, the strongest incremental visitation results came from a younger population, who are typically non-customers. Targeting this group offers the most potential for incremental visitation driven by advertising. 1 comment about "Driving Restaurant Visits: Where To Place Your Ad". Jaffer Ali from PulseTV, January 3, 2019 at 2:44 p.m.
One of the most moronic posts and lessons you will find...as it suggests the future will resemble the past...and the author knows nothing about complex systems...in which our marketing environment is certainly an uncertain, complex system. Media owners love marketers to use LTV of course so they can charge more for their media.